Again this year, some of us are going to one of the greatest OSS convention in Europe, FOSDEM in Brussels. This year, it takes place on the 2 & 3 of February. If you are going too, this is the opportunity to learn more about the XCP-ng story during Olivier Lambert's (CEO) talk: XCP-ng - From Kickstarter to Datacenter. You may even have the opportunities to get some of our shiny stickers. ⚠ Warning: This feature is only available using the XCP-ng hypervisor. Download it here. Zstd compression in our real case test scenarios is around 6 times faster than the XenServer default compression (GZIP) and delivers between 5% and 10% smaller backup files. zstd compression is not only saving space on your remote, it makes your backup even faster than without compression: depending on your disk content and host CPU, this can be up to 4 times faster! 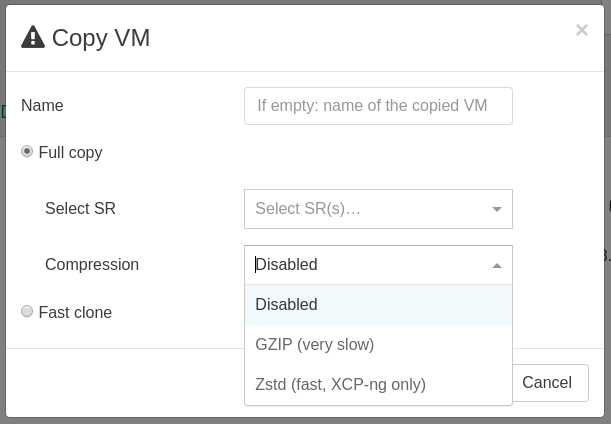 This feature is (for now) only available in the XCP-ng hypervisor. This might be the right moment to try our open source alternative to Citrix if you haven't yet adopted it! And for companies requiring support for their production environment, XCP-ng provides pro support plans. The remote space used and left is now directly displayed in the backup view of Xen Orchestra. This is particularly useful if you want to monitor the space consumed by your backup and choose a remote with enough space left when creating a new backup job. When selecting a host for migrating a VM, you will now see the RAM available on that host. You can now snapshot a group of VMs. If you deploy a bunch of VMs that you want to snapshot at different moment (eg. after you have done the basic configuration) - you can now snapshot all the VMs at the same time instead of one by one. You have now the ability to snapshot a VM's memory. 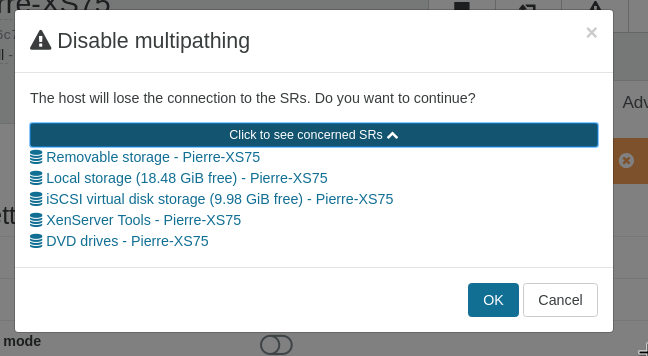 You now have the option in the SR view to enable or disable iscsi multipath. 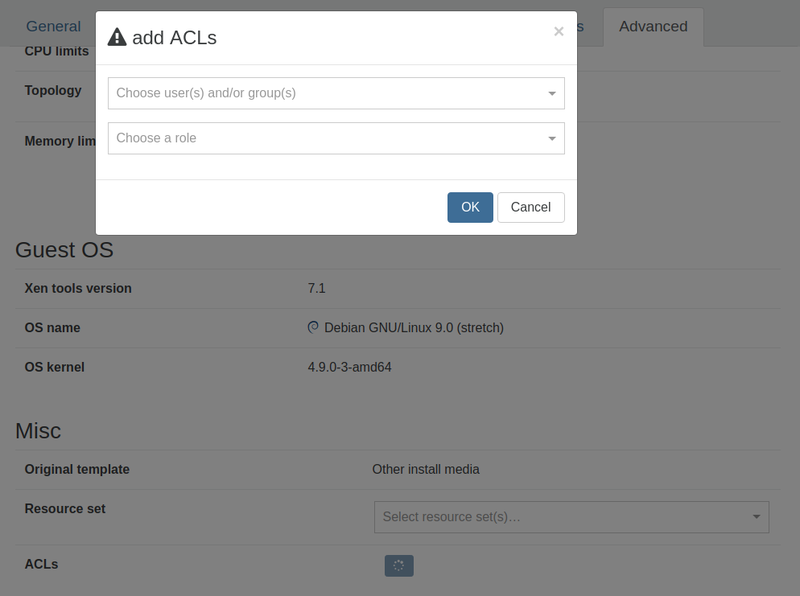 You can now set ACLs for a VM directly in the VM view. This will also allow you if the VM is already linked to existing ACLs. We have improved the overall performances when using a SMB remote storage. The information about the PIF speed is now display. It will allow you to check if the speed negociation is the right one. You are now notified when there are orphan snapshots to delete in your infrastructure. This notification is visible directly in the backup view. 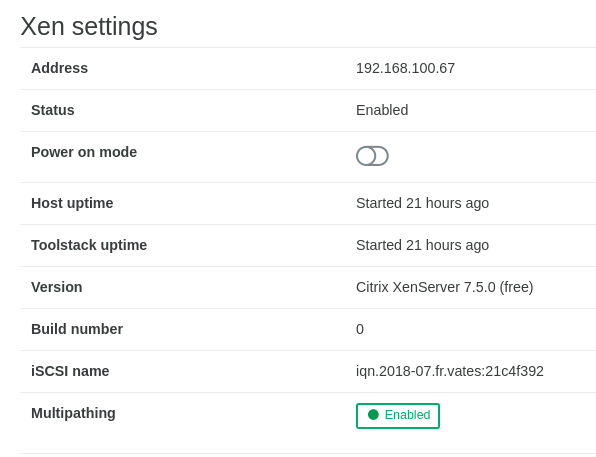 You will now receive notifications directly in your Xen Orchestra appliance for important information (eg. your license is about to expire).